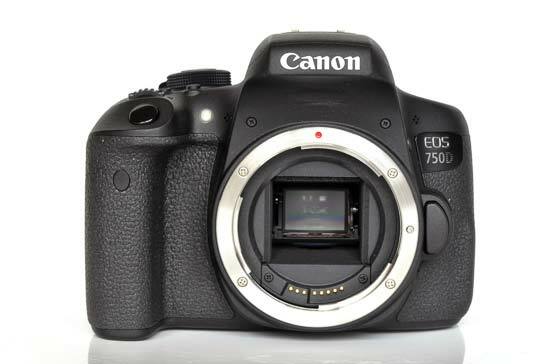 The Canon EOS 750D (Rebel T6i, as it’s branded Stateside) succeeds the EOS 700D/Rebel T5i introduced in 2013. It features a new 24.2-megapixel APS-C CMOS sensor with an ISO range of 100-12800 (expandable to ISO 25600), as well as 5fps continuous shooting. Canon has also implemented its DIGIC 6 image processor which supersedes the DIGIC 5 unit found in the 700D, and the new model also receives an upgraded 19-point autofocus system pulled from the EOS 70D. The 750D’s exposure metering system is new, too, as is the inclusion of Wi-Fi connectivity with NFC pairing. Externally the 750D is almost identical to its predecessor, featuring a 3-inch 1040k-dot LCD display that’s both touch-sensitive and able to articulate. The camera’s physical control layout is also very similar to the 700D. 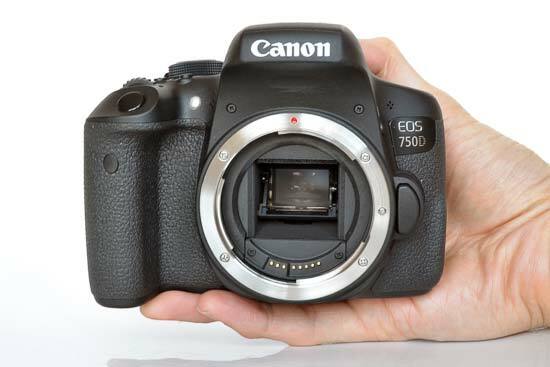 However, if you like the look of the top-panel LCD display and rear control wheel on the EOS 70D, the new 760D introduced alongside the 750D includes these features, but in every other respect is identical to the 750D. Expect to pay around £600/$750 for a 750D body, or £690/$850 for an 18-55mm lens kit. On first handling the Canon EOS 750D you’ll be hard-pressed to tell it from the old 700D. Both cameras share a near-identical case design and control layout, and their size and weight are also closely matched. The 750D is marginally narrower at 131.9mm and slightly shallower at 77.8mm, though its 100.7mm height is all of 0.9mm more than the 700D. Despite these similarities, Canon has managed to bring the ready-to-shoot weight of the 750D body down to 555g – 25g lighter than the 700D and 10g lighter than the 760D. Build quality is as high as you’d expect at this price point. The chassis structure is all-plastic rather than magnesium alloy, but it feels very solid with no flex or squeaks. Rubberised panels on both sides and on the rear thumb rest give great grip, but there’s no weather sealing, so you’d be wise to take care in dusty or wet environments. Weather sealing is a feature most manufacturers reserve for their enthusiast-level DSLRs, so you’ll need to step up to a 70D or 7D Mark II to get this protection. Differences between the EOS 750D and 760D are subtle, but one of the most noticeable is the 750D’s lack of a secondary top-panel settings display. These are somewhat of a legacy from the days of film cameras, but are still useful for clearly displaying current shooting settings whilst using minimal battery power. 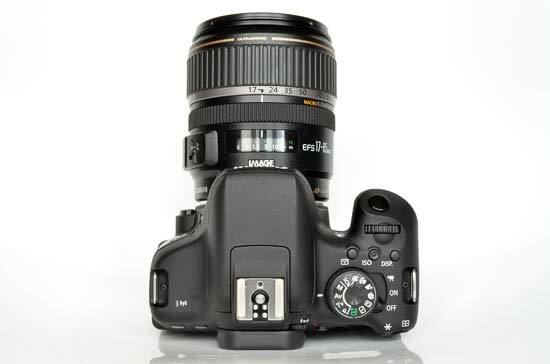 The 750D’s top panel instead uses a similar control layout to the 700D and rival Nikon D5500, with the mode dial situated next to your right hand. The mode dial options are typical of an entry-level DSLR, including the standard Program Auto, Shutter Priority (Tv), Aperture Priority (Av) and full Manual control. Canon groups these four modes into what it terms the ‘Creative Zone’, separating them from options like scene mode pre-sets. There isn’t a bewildering selection of these pre-sets though, as Canon has pared the available options down to Kids, Food, Candlelight, Night Portrait, Handheld Night Scene and HDR Backlight Control. The latter is particularly useful, capturing three consecutive shots of the same scene to significantly broaden the camera’s dynamic range for more realistic images in high-contrast environments. Further round the mode dial are four separate modes for use when shooting Sports, Close-up, Landscape and Portrait images. Each mode prioritises appropriate shooting settings to flatter your subject, such as using a wide aperture and subdued colour tones to enhance portrait shots. Once you’re familiar with the concept of things like aperture and how it impacts your photos, these tricks can easily be replicated manually, but having dedicated automatic pre-sets is still useful if you’re making the leap to a DSLR from a point-and-shoot or bridge camera. The same also goes for the Creative Auto shooting mode which groups background blurring options, ambience-enhancing colour tone settings, drive mode and flash controls into one mode dial setting. The two remaining mode dial options are the fully automatic Scene Intelligent Auto mode, plus a very useful Flash Off mode. With the 750D in Auto mode, the flash is free to pop and fire if the camera detects a low light environment, which can quickly get you thrown out of a museum or gallery. Switch to the Flash Off mode and the camera stays fully automatic, but simply stops the flash from firing. You could achieve the same result by switching to Program Auto mode, but then you’d also have to ensure things like white balance and ISO sensitivity are set correctly. 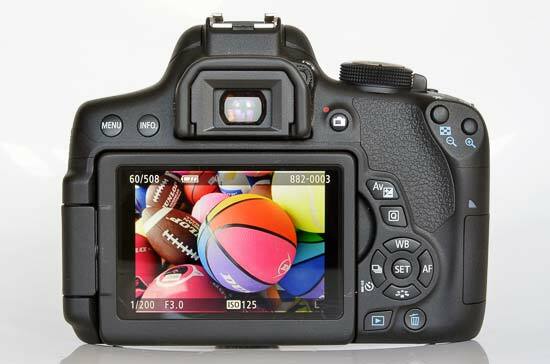 Also on the top panel of the Canon EOS 750D is a single control wheel for adjusting settings like aperture and shutter speed when in aperture or shutter priority modes. In full Manual mode the dial operates shutter speed, but by pressing and holding the exposure compensation button on the rear panel, the control wheel will adjust aperture instead. One advantage with the 760D is that it gets a rotating click ring around the D-pad, allowing you to simultaneously adjust aperture and shutter speed. Back to the 750D’s top panel and we find two new buttons that weren’t present on the 700D. On both cameras there’s an ISO button between the mode dial and control wheel (a button Nikon refuses to include on rival D5x00-series cameras), but the 750D flanks it with a button for turning the LCD display on and off, as well as an autofocus point selection button. The latter is great when you need to switch quickly from normal autofocus to configurable zone or single point modes. It’s also worth noting that the 750D’s autofocus system itself is a significant upgrade over that used by the 700D, upping AF points from nine to nineteen. That may still seem rather stingy compared to the 39-point AF system in the Nikon D5500, but where this only features nine of the more sensitive cross-type focus points, all nineteen of the 750D’s AF points are cross-type. Moving to the rear panel controls on the Canon EOS 750D and its very much business as usual if you’re already familiar with the 700D’s layout. Between the sizable and ergonomic rear thumb grip and the viewfinder is the live view button, and on the other side of the thumb grip are the zoom controls for image playback. Further down the camera but still within convenient thumb reach is the exposure compensation button which works in conjunction with the top panel control wheel, and directly beneath it is the Quick Control button. This displays a menu screen containing key shooting settings available for adjustment in the current shooting mode. The menu layout is the same as the current setting read-out visible during shooting, so there’s never any doubt as to where you need to look for the setting you want to adjust. What’s more, each shooting parameter on the Quick Control menu is large enough to be accessed by touch. Yes, like its 700D predecessor, the 750D’s 3-inch, 1040k-dot LCD screen is touch-sensitive. Canon’s implementation of the technology is subtle, so much so that if you’re coming from a traditional DSLR, you need never use the touch controls and the 750D will function just as you’d expect using the normal D-pad directional controls and SET button on the rear panel. However, once you try selecting different shooting options on the Quick Control menu and adjusting them via the touch screen, it doesn’t take long to appreciate the ease of such direct control. Switch to live view and the ability to touch the screen to select a focus point is also very handy. Swiping through shots and pinch-zooming during playback is also great, and though zooming isn’t quite as slick as on a high-end smartphone, it’s certainly more convenient than using the 750D’s physical zoom buttons. In addition to the Canon EOS 750D’s screen being touch-sensitive, it’s also a flip-out unit that’ll face forward to help with snapping selfies, plus it’ll rotate through 270 degrees for high and low angle shooting. But even without these extra tricks, the 750D’s display is a pleasure to use. Its high 1040k-dot resolution makes it easy to check for accurate focus, and image reviewing is further helped by superb colour and contrast accuracy. The display’s viewing angles are also extremely wide, so you can comfortably compose a shot using live view whilst holding the camera well above or below head height. The 750D’s viewfinder is almost identical to that used by the 700D, though magnification has reduced from 0.85x to 0.82x. Viewfinder coverage is unchanged, showing 95% of the image frame. Although this is a match for the Nikon D5500, the Pentax K-S2’s viewfinder boasts 100% frame coverage, making it easier to accurately compose your photos. Whilst the Canon EOS 750D’s screen and viewfinder may be virtually unchanged from the 700D, the new camera boasts far better connectivity thanks to built-in Wi-Fi with NFC pairing. First impressions of this feature aren’t great, however, as the camera lacks a physical button to directly activate its Wi-Fi access point. Instead you’ll have to navigate the 750D’s main menu to activate Wi-Fi, and here you can also choose whether you want to transfer images between cameras, connect to a smartphone, print from a Wi-Fi printer, upload to a web service or view images on a DLNA-enabled device. The Wi-Fi connection process can be a bit of a faff when pairing with a traditional smartphone, requiring you to first connect to the 750D’s wireless hotspot and then open the Canon Camera Connect app. The procedure is much simpler if you own an NFC-enabled smart device, as you’ll be able to simply tap it against the camera to create a connection. Once connected to a smartphone, you’ll be able to view and download images remotely, with a full resolution, high quality JPEG image transferring in around eight seconds. The app will also allow you to remotely control the 750D and adjust settings like aperture, shutter speed and ISO sensitivity, though you will of course have to set the zoom manually. Despite its fairly technical setup and connection process, once connected, the 750D’s Wi-Fi maintains a stable signal and performs well. Operating the Canon EOS 750D is quick and easy, partly thanks to its intuitive button layout and touch-screen controls, but also the clear, tabbed main menu layout that does away with any form of scrolling. 11 tabs are spread across the top of the screen, divided into three pages of shooting options, one display settings tab, two tabs for playback settings and four pages of camera customisation options. The final tab is a customisable ‘My Menu’ where you can add various settings to create your own menu tab of frequently-used options. The menu design is also touch-friendly, though you can only reveal and hide the menu using the physical Menu button located above the LCD screen. The camera is fast and accurate to focus, but you’ll occasionally find it necessary to manually select your desired focal point. Naturally, autofocus speed and performance will partly depend on your choice of lens, but with an EF-S 17-85mm f/4-5.6 IS USM optic fitted, focussing speed in good light was less than 0.1 seconds. Dimmer conditions caused the camera to lock on in around 0.5-1 second, but focus hunting was never an issue. It’s not just autofocussing that’s fast, as the 750D also benefits from the new DIGIC 6 image processor for fast continuous shooting. This isn’t actually any faster than the 700D at 5fps, but with over 30% more pixels to push in the 750D, it’s a respectable performance, especially as the 750D will maintain this speed for 940 JPEG shots where the 700D could only manage 22. Battery life is less impressive, however. The outgoing Nikon D5300 already had the 700D’s 440-shot lifespan beaten, but the Canon EOS 750D retains the same capacity, whereas Nikon has upped the D5500’s battery life to a whopping 820 shots; almost double that of the 750D.